At acutabovecalendars.com, we strive to make each year unique and unusual. Count on spectacular photos, taken by local artists. Find pertinent information about Lake Tahoe, the creatures who inhabit the area, its trees and flowers. You'll discover hiking trails and learn about special events. New this year is a challenge to "Name the Mystery Plants" and be awarded a calendar, mug, T-shirt or tote! See the November page of 2014 for details. 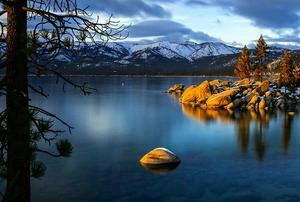 for a glimpse of Lake Tahoe you may not have seen before. Ask about personalizing these show pieces for your business or special events. A calendar, printed with your logo and business information, makes a great year-end gift! Your clients will be sure to remember you if you present them with a custom-made calendar. We'd love to hear from you! Please feel free to call (775) 831-1331 or use the contact form below. All inquiries will be answered. A Cut Above Calendars is a proud member of Tahoe Business Exchange, a group of businesses in the Lake Tahoe area, who have joined together to form a Business Networking Alliance and partnership--businesses committed to excellence and high ethics. Please see the website for more information about the members of this group or how to join: tahoebusiness.org. 2018 calendars hot off the press!